Up the hill from Igreja Paroquial de Santo Ildefonso is a pedestrian only road, Rue de Santo Ildefonso, that’s one of central Porto’s less formal restaurant districts, with a good dozen smaller cafés, restaurants, and ice cream shops, and Santiago has obviously been around a while. Originally opening in 1959, it’s had more than a few renovations since then, and now is a split-level café spanning the block between Rue de Santo Ildefonso and Rue de Passos Manuel, much in the style of a US diner, with a combination of table, counter, and outdoor patio service. 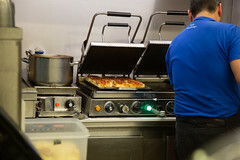 They’ve got quite the extensive menu of Portuguese café fare, ranging from soups, to bacalhau, to a variety of grilled meats served up with fries. 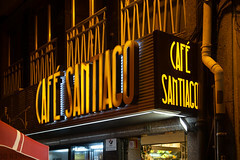 But there’s one reason one comes to Café Santiago: it’s one of the canonical places to get a Francesinha. The name “Francesinha” means “Little Frenchie”, and it’s one of the hallmark dishes of the Porto region. Nominally invented by a Portuguese émigré to France who came back to Portugal and was attempting to modify the French croque monsieur to local tastes, and, to use an American term, basically took the concept and added a whole lot of cowbell to it. Pretty much every single “café” in Porto offers some variety of this sandwich. You start by making a sandwich out of what us Yanks would call Texas Toast: thick, slightly crusty slices of white bread. Put on some steak or roast beef. Some ham (wet-cured style, not the dry-cured Iberian stuff, although I’m sure someone in Porto is doing that). Some linguiça sliced in half and grilled. 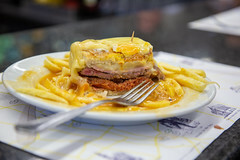 And maybe even a few other meats, this being one of the places various cafés customize their own take on the Francesinha. Add some cheese. Cook that in a panini press until it’s all crispy. If you so desire, put a fried egg with a runny yolk on top of that. Layer several overlapping pieces of cheese over that (if using an egg, cut out little semicircles from one side of each piece of cheese so that the yolk peeks out), and melt the cheese under a broiler. Then, put that on a bed of fries. 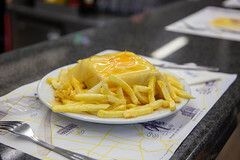 Then cover the entire thing with a tomato-and-beer spicy gravy, the exact constitution of which remains a murky trade secret of, and one of the distinguishing factors between, each competing Francesinha establishment. Yeah, it’s a heart attack on a plate. I’m surprised we don’t have a variation in the States. But the resulting sandwich is really a sight to behold: a mountain of food, enrobed in cheese and gravy, allowing you to pick off little slices of sandwich and cheese, dripping with the spicy gravy, each having a slightly different composition of meat filling. Follow that up with some fries dredged in the gravy as well. 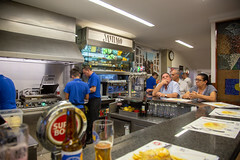 And then everything gets washed down with a beer; while the Portuguese seem to like to drink red wine with everything, this is a notable exception; the social expectation is that you’ll get a “fino” of beer to wash down your Francesinha. 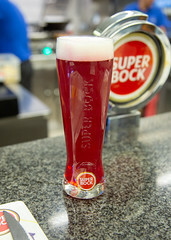 If mine looks red here, that’s because I was enjoying a Super Bock (the main beer of Portugal) as a “Tango”, basically mixed with redcurrant syrup (hence the color). And you know what? The combination works. I really enjoyed our meal; Café Santiago itself is quite pleasant, the Francesinha is a wonderful, if gut-busting, tradition, and it’s rather fun to sit at the counter and watch the staff efficiently assemble so many Francesinhas (it’s like going to one of the larger Steak and Shakes and watching them do a large batch of burgers). I’d love to come back to Porto and try out some of the other classic Francesinha cafés to try out their variations on the fillings and the sauce.